I received this delightful book for Christmas, ordered for me from the Jane Austen Centre in bath, and as a fan of both cooking and Jane Austen I could not have been more excited – I was even excited over the brochure from the JACentre! I rightly assumed I would be able to easily create a number of the dishes depicted and would learn quite a bit at the same time.So far, I admit, I have had the time to make just one (and it was a beverage!) however there are certainly plans for others in the works and I absolutely adore flicking through the book and reading the recipes – many of them seem completely simple as well, which is encouraging. As I’m vegan, I also have the added complexity of replacing animal ingredients, especially butter and egg which feature heavily in many of the recipes, with alternatives – I will keep you posted on my progress (both of these have ample substitutes but they can alter flavour and texture quite dramatically). The recipes come with both the ‘original’ and a modernized translation, and it’s quite good fun just reading between the two and finding out what it really means when an old chef required you to use a ‘larding needle’ or to ‘Be careful that it is jointed before you lay it down to the fire’ or to know what the difference between young spring carrots and old sandwich carrots really is. For the less-cooking inclined, don’t be disheartened. There are tidbits throughout about the different dishes, where they originated from, what the customs were for different meals and quotes from different books. There are also some great rules of thumb about laying a Regency table, hosting a dinner party, making a cup of tea and hosting a ‘card party’. When it comes to the instructions themselves, they’re very simple and direct, which makes life easier. You’ll find them more basic than you’d expect for the Regency, and yet it’s somehow very fitting (they’re also simpler as we have modern techniques that help us blend quicker etc). What’s a little icky is how unhealthy the dishes are – but they are kept inkeeping with how they would have been at the time, and the requirement for corsets for many is mentioned! Unfortunately, not all of the recipes are 100 per cent accurate. The drink I made, the Netherfield Negus, called for red wine (I used port for a stronger flavour), sugar (I used raw brown sugar), water and fresh nutmeg (I used ground as it’s all I could find) – however the instructions also discuss lemons (I bought two for making it and this worked out perfectly) but they aren’t listed in the ingredients. 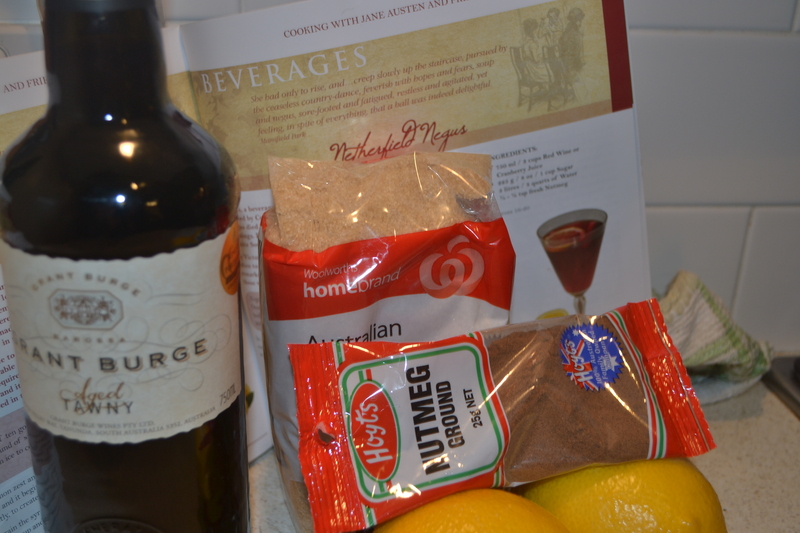 Essentially, boil up the water, put in the sliced lemons, sugar and then wine and eventually add nutmeg to taste. I sort of added everything to taste as I am not great at following amounts. What results is an excellent depth of flavour – akin to mulled wine or mead. It’s a great winter comforter, as mentioned in the description in the book, and I’ve made it twice now (the second time with cranberry juice, which was slightly sour). It looks great, I’ve always been a fan of heated alcohol and, well, it’s named after Netherfield Park! 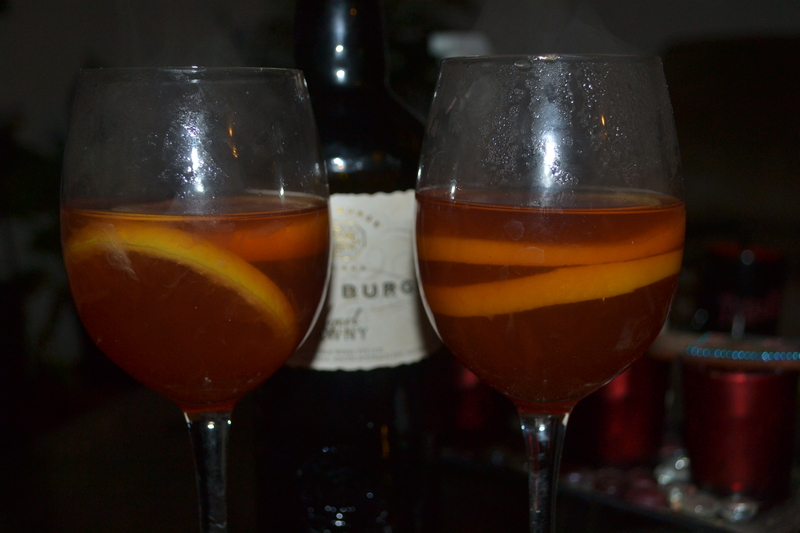 It was absolutely gorgeous – slightly sweet but with that alcoholic after taste, the thickness of port and a slight sharpness from the lemon. Perfect. I didn’t put too much nutmeg in so it barely registered on my palate, but I’m not sure I’d like much more of it and was wary about ruining the whole batch. Also on my list, and related to Pride and Prejudice, include Elizabeth Bennet’s Light, Bright and Sparkling Lemonade, Miss Bennet’s Perfect Cup of Tea, Mrs Bennet’s Best Apple Pie, Mr Hurst’s Ragout of Lamb, Rosings Roast Beef and Yorkshire Pudding, Mr Darcy’s Favourite Beef Steak Dinner and Mr Bingley’s Broiled Salmon. For a full list of the recipes, you can have a look at the official website for the book. Of course, the other novels and features of Jane Austen’s life also have associated food, of which there are several free online. Ms Boyle explains in the Introduction that “The recipes have been named after people and characters that either have a direct relation to the particular food or have a personality evocative of that dish.” This is interesting in itself in terms of who was given which dish in their name’s honour. Luckily, every food item comes with a picture so you can be fairly aware of whether you want to cook it beforehand and how it should look if you do. Some don’t actually look all that appetizing, but one that does is the Yorkshire Pudding with the butter sauce. I’ll be attempting a vegan version of this soon. As an English born and raised girl, Yorkshires are on my love list. Learning more generally about the cuisine is quite interesting, especially in terms of how savouries and sweets were often served together (or even in the same pie, as in the meat and dried fruit recipe for mince pie). It’s great to see recipes from cocoa and wedding cake to apple sauce, pickled beets and asparagus all Italiana. It’s a strange mix. Another recipe I’m quite excited about is the ‘Bath Buns’ which call for a, previously unknown to me, ingredient called ‘Caraway seeds’ or ‘Caraway Comfits’. Jane Austen mentioned them herself in a letter to Cassandra, as quoted above the recipe, and they look so soft and rustic that I’m dying to try making them. If you’re looking to purchase the book, you can buy it online or at the Jane Austen Centre (they ship all over the place). It’s 68 pages, and around $15 (ISBN: 1907129103). Which dishes would you associate to which character? I’m thinking something sour for Caroline Bingley, and something wickedly rich and over indulgent for Lydia Bennet (some sort of party-goers gateau?). I really want to host a dinner party right now! If only I could make more than macaroni and ramen. I would imagine a deceiving dish for Mr. Wickham. You know, one of those foods that look and smell way more appetizing than they actually taste. Bahahaha, I agree! I imagine something that looks delicious but you feel crap after eating (like heavy-fat foods etc). Get the book, it’s seriously fabulous!